On June 16, 2004, Dave's daughter Pamela was married to a Scotsman, Paul Sharp at Doune Castle in Scotland. Above are his parents, the loving couple, and her parents. The event provided an excellent opportunity to explore Glasgow, Edinburgh, and the Scottish countryside. This pictures are from those explorations. 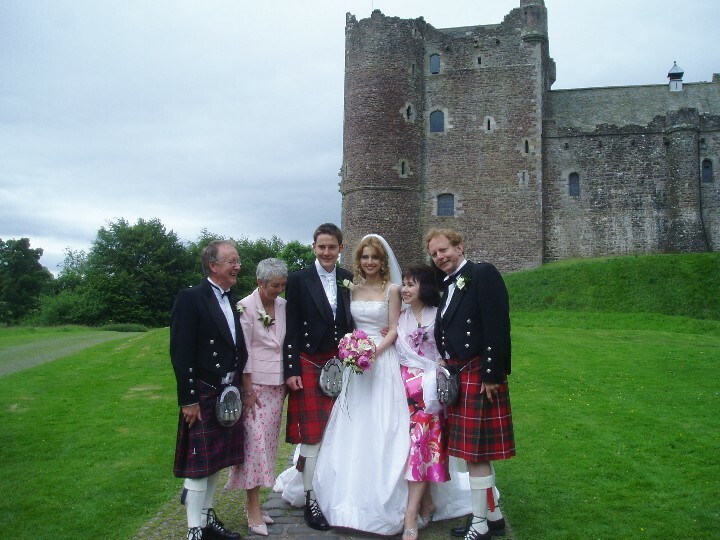 The wedding was in Doune Castle, just north of halfway between Glasgow and Edinburgh. Nearby is the city of Stirling, which has a castle of its own. Edinburgh is more dignified, with its dignified eighteenth and nineteenth century architecture. But it, too, is a booming city. After Edinburgh, we went north, through St. Andrews to Inverness. From there, we came down along Loch Ness to the western coast and cut across through the highlands and the moors to Stirling again.